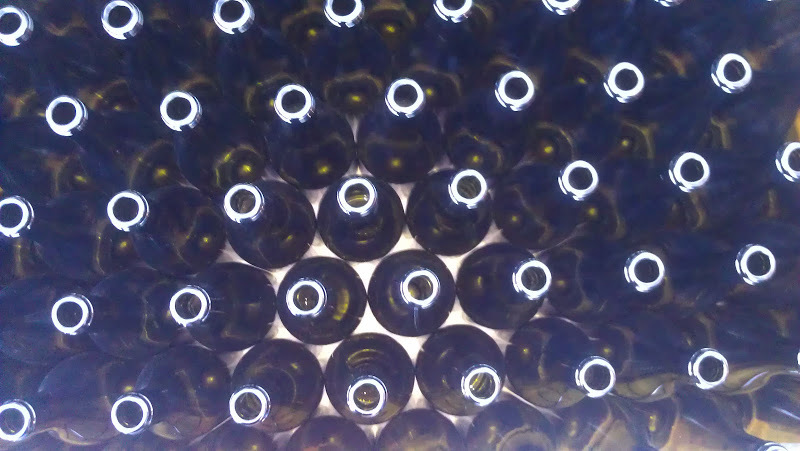 Close your eyes and imagine you are in a large manufacturing plant surrounded by the whir of machinery and the clatter of bottles as they rush down the production line. You get your bearings by gazing around and seeing numerous people in coveralls intently shepherding what appears to be beer bottles going down a production line. You notice one employee standing next to you. She’s a tall woman and you take note, this kid is not like the others. She has made her coveralls very unique by putting a large cursive “L” on the shoulder. This triggers deep-seeded memories of childhood TV watching and you are kinderstruck. Wait a second….it’s coming back…..is that Shotz Beer? and am I in the Shotz Brewery? You suddenly realize you’ve somehow time traveled back to 1970’s Milwaukee (funny how the attire is not that far off from how 2012 Seattle hipsters dress). 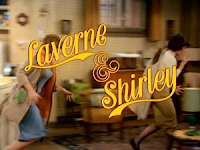 Many of you may be too young to remember Laverne & Shirley (worth checking out on DVD). 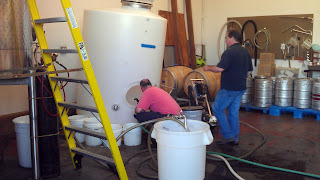 But, this is exactly the same memory both of us conjured up during our first (albeit not beer bottling) wine bottling experience recently at one of our favorite wineries, Nota Bene Cellars. 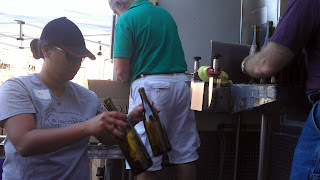 No, we did not quit our day jobs (wishful thinking), this was a volunteer job that proved to be both entertaining and educational (plus Tim, the winemaker, generously gave two free bottles of wine for every shift worked). Nota Bene Cellars is an urban winery located in an industrial park close to South Park (a hop, skip and a jump from where we live in West Seattle). 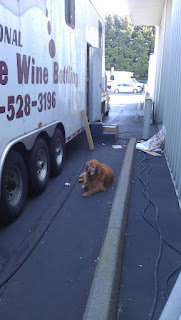 It’s a member of the South Seattle Wine Association (watch for a future blog on the SSWA). Tim Narby the “N” in Nota and his wife Carol Bryant the “B” in Bene are the owners and Tim is the principal wine maker. 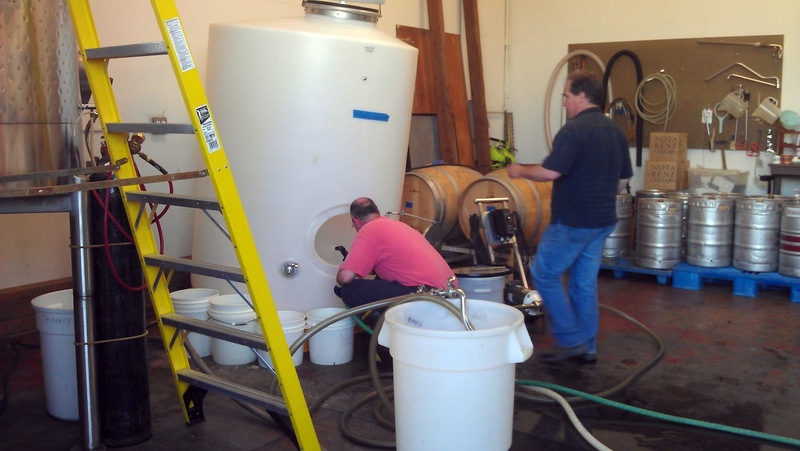 Their love for a particular bottle of wine enjoyed in Ashland, Oregon, inspired them to try making wine at home using a kit they received as a wedding present. That person should be thanked because Tim has honed his skill and is making some amazing wines using the finest WA grapes he can source. Both Tim (a Boeing Systems Analyst) and Carol (a State Prosecuting Attorney) balanced busy day jobs and a family to get their dream off the ground. We admire that as we also someday hope to walk away from our day jobs and pursue a business venture that involves one of our passions. 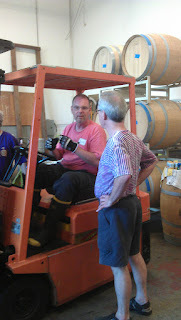 Tim driving a forklift. What can't he do? The winery quickly became one of our favorites after we visited it on a 2nd Saturday (SSWA wineries are normally only open every 2nd Saturday of the month). On our first visit we were surprised by how many bottles were in their tasting line-up (eleven in total) and doubly surprised when we liked every one of them. 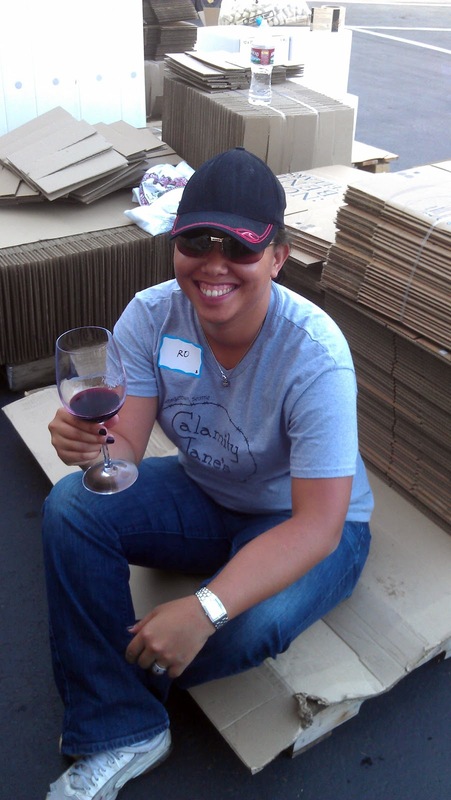 Must we remind you that we are picky (not wine snobs—we just know what we like and don’t like). The secret we believe is very much like what makes successful chefs and restaurants great. Tim sources high quality grapes from the best vineyards (quality ingredients) and he’s skilled enough to know how to let those ingredients sing. As we walked into the Nota Bene ”production facility”, which was a pretty cool 24 ft mobile trailer set-up from Custom Bottling Company, we tried to take in the beehive of activity that was occurring. We rolled up our sleeves and got assigned to handing empty bottles up to the first man on the production line. This was quite a risky job as you had to have a good hand-off or those bottles crashed to the hard ground. We both made it out without breaking a bottle—whew! Later on Ro got to switch jobs and put the caps on the bottles (guess she graduated). 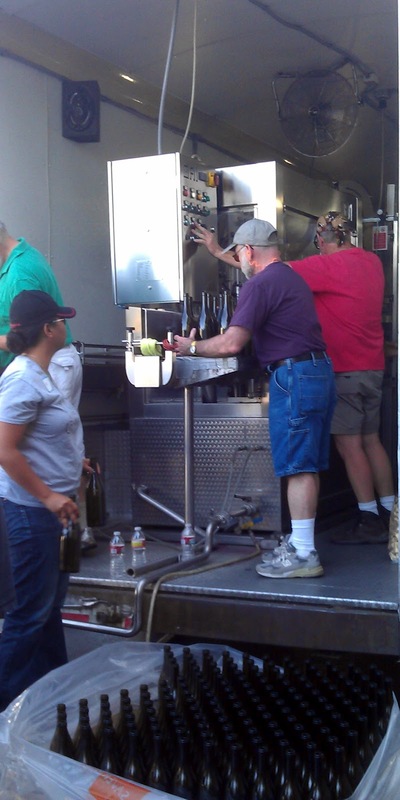 The owner of the mobile machine showed Ro how to put the caps on the bottles and told her that he was just at Charles Hoppes' winery the day before bottling his wine. 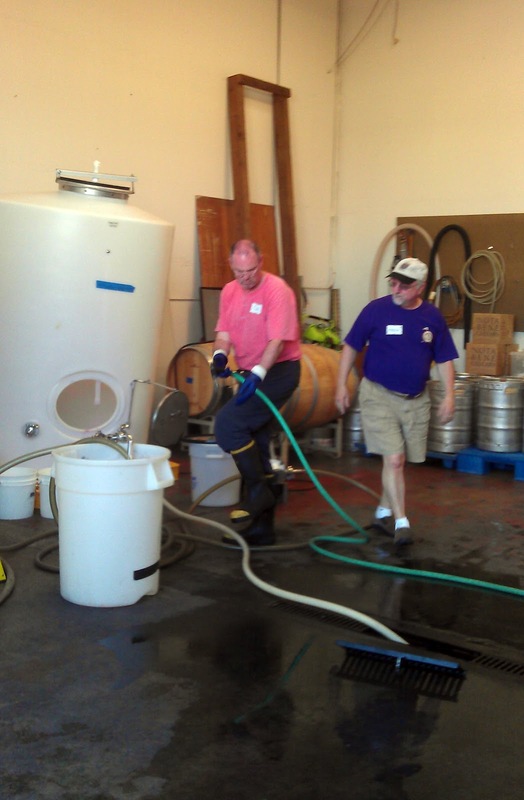 Charles Hoppes is the owner and winemaker at one of Ro's favorites, Fidelitas. He proceeded to tell her that kids could do the job Ro was doing and that Charlie was running out of kids (apparently he has quite a few). Gotta love child labor! The group of volunteers at Nota Bene worked together like a well-oiled machine. Everyone seemed to know their roles well, which meant we must have been the only newbies. This was hard labor and we were glad we had anticipated sore muscles and booked a massage the next day. 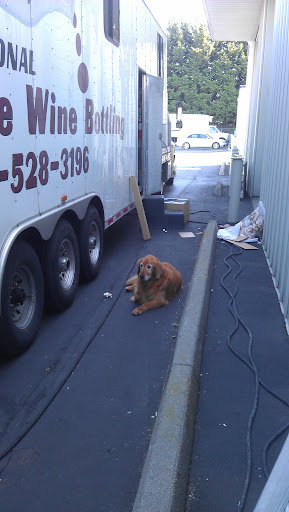 There were two special helpers that came with the mobile production facility, a senior golden retriever, Homer who loved chasing wine corks and his Chihuahua buddy that was more shy and stayed in the back of the trailer most of the night. 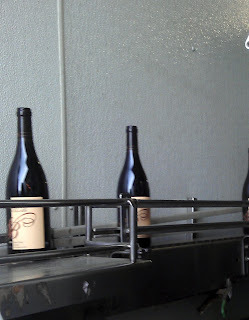 The best part was when we started to see the line run dry and the fork lift didn’t bring any more bottles. It was, blow the whistle, Fred Flintstone quitting time! Quitting time—was the fun time. The volunteers wasted no time partaking in the food buffet and the open bottles of Note Bene wine. Much better than Laverne’s Pepsi and milk concoction she whipped up after her shift at the Shotz Brewery. 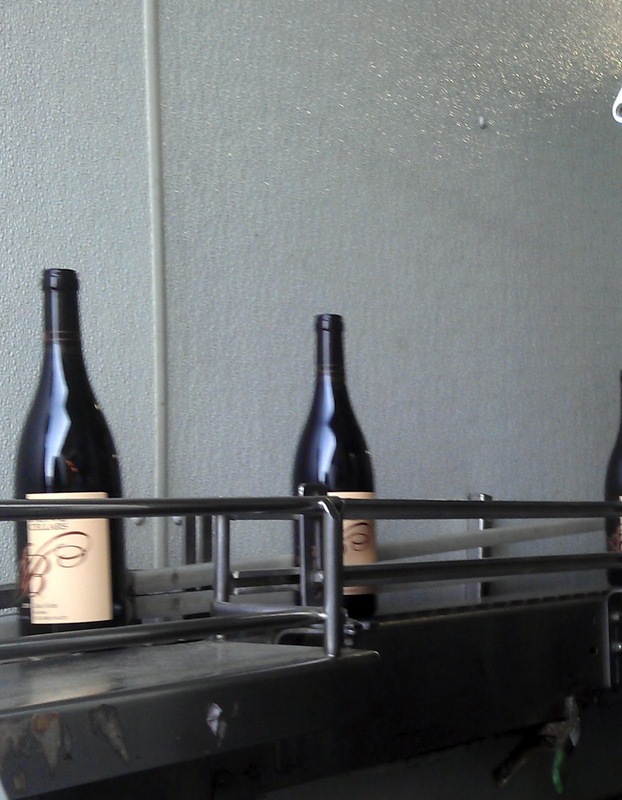 Note Bene Cellars is the story of the dream of Tim and Carol coming true. 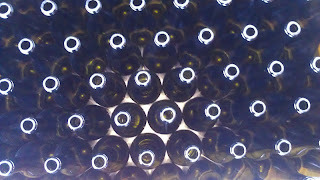 We had a great time participating in the bottling of what’s sure to be another award winning line-up of 2010’s. Now skipping arm and arm, just as Laverne and Shirley started every episode, we’ll start down the road of pursuing our dream. Give us any chance, we'll take it. Give us any rule, we'll break it. We're gonna make our dreams come true. This time there's no stopping us. We're gonna make our dream come true. And we'll do it our way, yes our way. Aloha! Live life with flavor and fun! I know it’s a bit late, but I’m so happy that your dream has finally come true. I can tell from the tone of your post that you really enjoyed working with Tim. Well, I believe that you can still pursue your passion—through hard work, of course. Anyway, the secret of making quality wine is based not only on the quality grapes that the winemaker harvested, but also on the winemaker’s skills.